In ICAS’ 2017 monitoring report (https://www.icas.com/regulation/insolvency-monitoring-annual-reports), that RPB puts the decrease down to the number of IPs who have retired, which I suspect is probably the case across the board. And we’re not seeing their number being replaced by new appointment-takers. I can’t say I’m surprised at that either: regulatory burdens and personal risks continue to mushroom, formal insolvency cases (especially those with assets) appear more sparse and the media has nothing good to say about the profession. Why would anyone starting out choose formal insolvency as their career choice? If we were asked what areas of apparent misconduct we thought were the top of the InsS’s hit-list, I suspect most of us would answer: IP fees and pre-packs. But, as you can see, these two topics have never featured large in complaints. The following analysis supports the perception that IVAs are attracting fewer complaints than in recent years, although IVAs are still number one. In fact, it demonstrates that all insolvency proceedings are attracting fewer complaints. … it would seem that complaints about ADMs and PTDs aren’t dropping quite as quickly as those for other processes. Putting the two analyses together leads me to wonder whether ethics-related complaints involving ADMs now form a disproportionately large category of complaints, particularly in view of the relatively small number of ADMs compared with IVAs and LIQs. Press coverage would also appear to support this area as a growing concern. 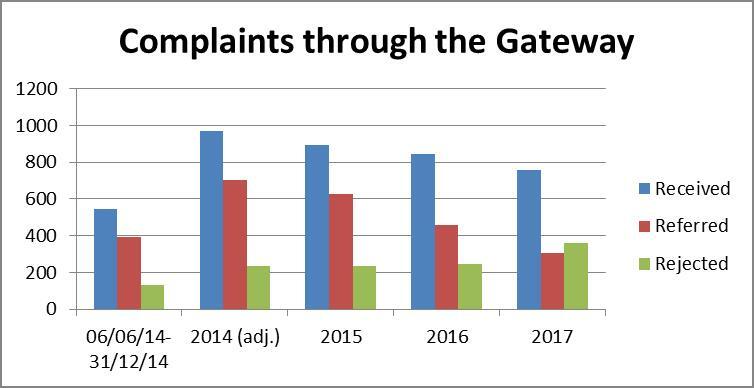 This shows that creditors are the only category of complainant that has seen an increase in the number of complaints lodged over the past year. Could the profession do more to help creditors understand insolvency processes and especially ethics? Wow! So for the first time, the InsS rejected more complaints that it referred: almost half of all complaints were rejected (48%) and only 41% were referred. 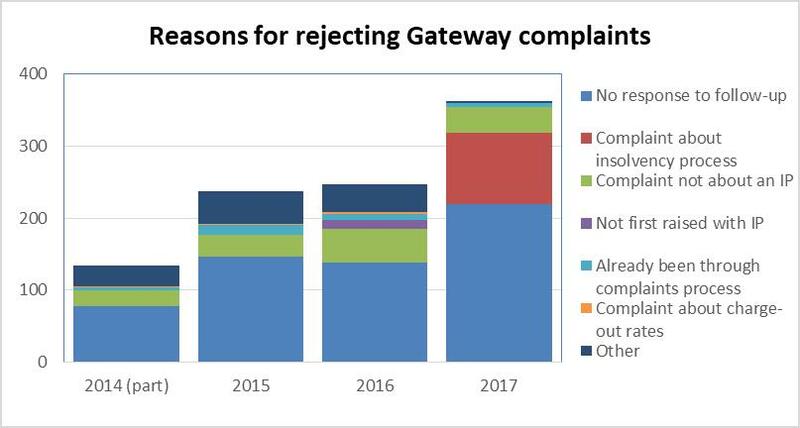 Compare this to the first few months of the Gateway’s operation when only 25% were rejected and 72% were referred. 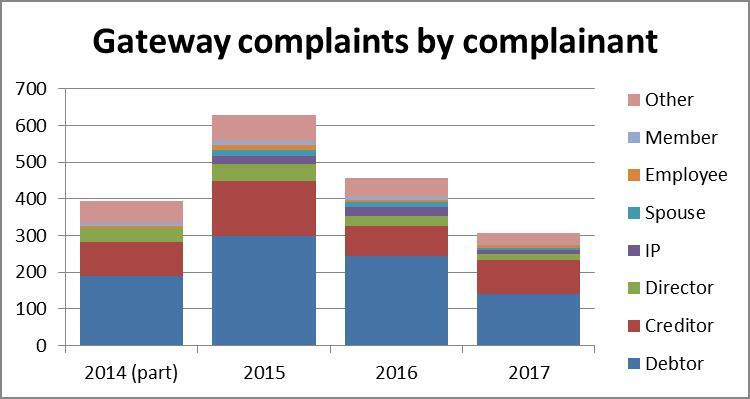 Nevertheless, setting aside the number of rejected complaints, it is good to see that even the trend for the number of complaints received is a nice downwards slope. And in case you’re wondering, I suspect that the remaining 11% of complaints received are still being processed by the IS – a fair old number, but pleasingly a lot less than existed at the end of 2016. 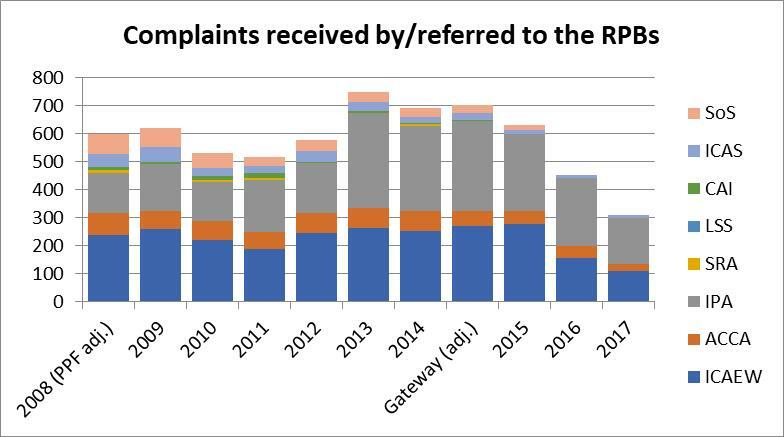 This indicates that a large part of the increase in rejected complaints is because more complainants have not responded to the Insolvency Service’s requests for further information. 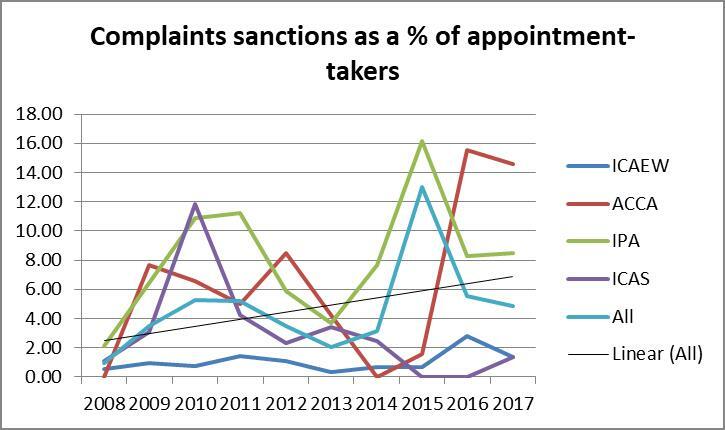 The trendline here suggests that a complaint was twice as likely to end up in a sanction in 2017 as it was 10 years’ ago. 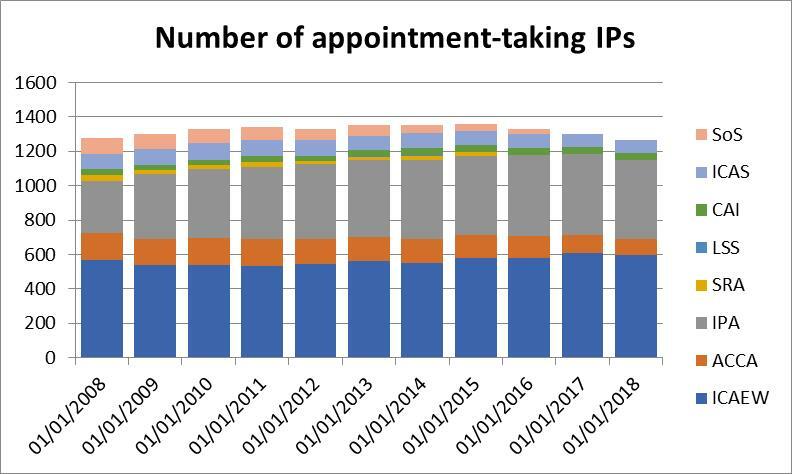 This shows that the number of complaints sanctions per IP has also been on an upward trend: around 1 in 100 IPs received a sanction in 2008, whereas this figure was closer to 1 in 20 in 2017. For example, the InsS report describes one IP’s disciplinary order, stating that the IP had breached SIP16 “by failing to provide a statement as to whether the connected party had been made aware of their ability to approach the pre-pack pool and/or had approached the pre-pack pool and whether a viability statement had been requested from the connected party but not provided”. Firstly, SIP16 doesn’t strictly require IPs to state whether connected parties have been made aware of the pool. Secondly, SIP16 states that the SIP16 Statement should include “one of” two listed statements, only one being whether the pool had been approached. Yes, I’ll accept that it seems the IP did not provide information on the existence of a viability statement, although I would have thought that, if a copy of a viability statement were not provided with the SIP16 Statement, then surely the likelihood is that the IP was not provided with one. I appreciate I am splitting hairs here, but if a SIP is not crystal-clear on what is required of IPs, is it any wonder that slip-ups will be made? And if a disciplinary consent order were generated every time an IP had omitted to meet every last letter of the SIPs and Rules, then I suspect no IP would be found entirely blameless. Ok yes, there exists a mysterious fanaticism around SIP16 compliance and we would do well to check, check and check again that SIP16 Statements are complete (and hang the cost?). However, I think this demonstrates how standards have changed: 10 years’ ago, would an IP have been fined £2,500 and have his name in lights for omitting one line from a report (hint: SIP16 began life in 2009)?